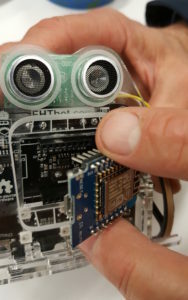 The heart of the FHTbot is an ESP8266 micro-controller. 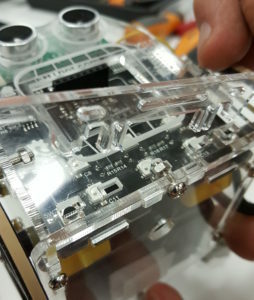 A micro-controller can be considered a miniature single chip computer. 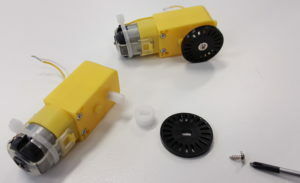 Thank you to Flinders University, Hackerspace Adelaide and PCB Way. 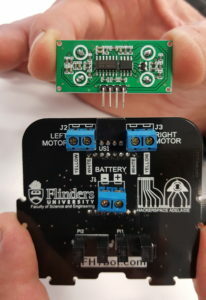 The FHTbot wouldn’t be possible without the generous contributions of Flinders University, Hackerspace Adelaide and PCB Way. Don’t do screws up too tight. Don’t use too much force, ask for help. Check that wires are connected correctly. Make sure the battery box is turned off when connecting to USB. Steps to build your FHTbot. Identify all the parts in your kit against the picture. 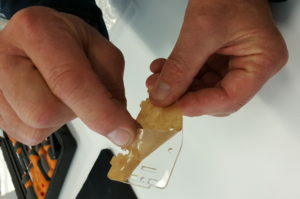 Peel the paper from all the acrylic parts. 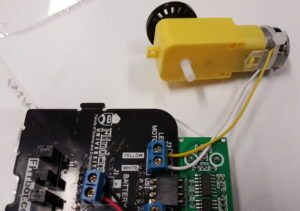 Punch out all of the waste from the slots in the encoder wheel. 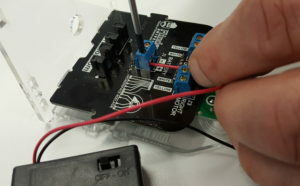 Gently press the sensor into the socket at the top of the main board. Gently press the front acrylic panel into the base then put the main board in place. Put the spacer on the motor shaft on the same side as the wires. 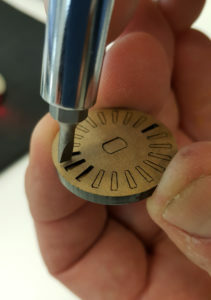 Then place the encoder on top of the spacer. 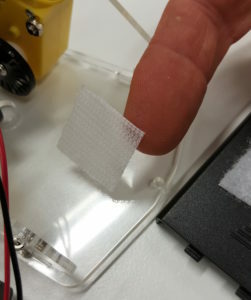 Be careful not to use too much pressure as acrylic is brittle. Ask for help if you need it. Screw each motor wire in place on the main board, match the wire colour to the writing on the main board. 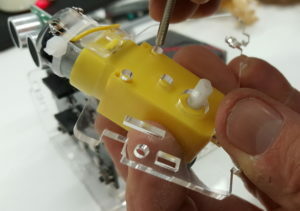 Screw the motors to the side panels and make sure that the solder terminals are facing inwards. 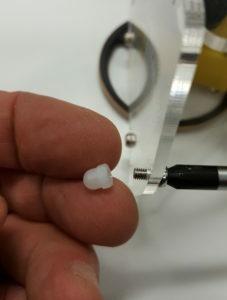 Insert the screws and nuts into the base. 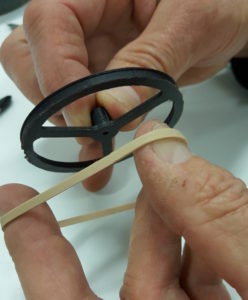 While supporting the nut with a finger insert the screw and tighten. 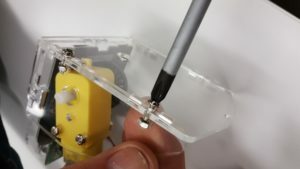 Don’t do the screws up too tight as the acrylic is brittle. Insert the second side panel from the back making sure to connect with the front panel and the main board. 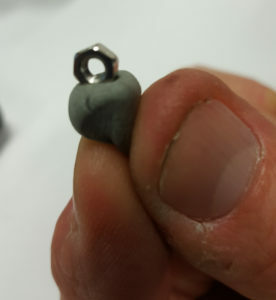 Use a piece of blu-tac to hold nuts if needed. Insert all of the screws and nuts. 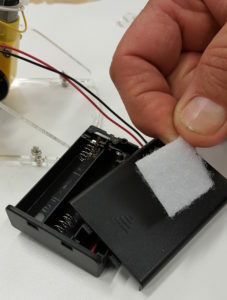 Stick the velcro to the battery box and the acrylic base of the robot. 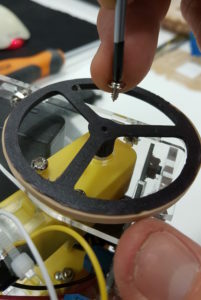 Put the tyres on the wheel and screw the wheels onto the robot. Screw the foot onto the back of the robot. 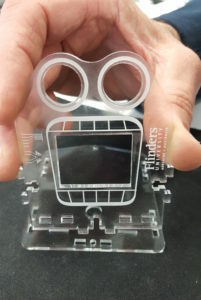 Insert the bumper into the front of the robot. 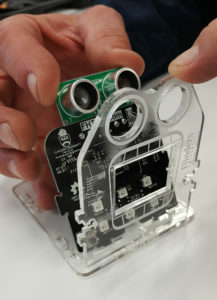 Insert the Processor, lining up the notch over the USB socket with the notch drawn on the main board. 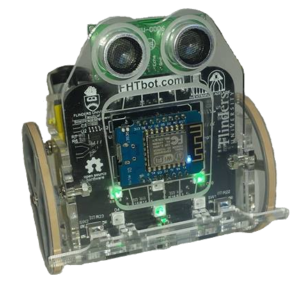 Get your fhtbot checked over and then insert batteries and turn on the switch on the battery box.